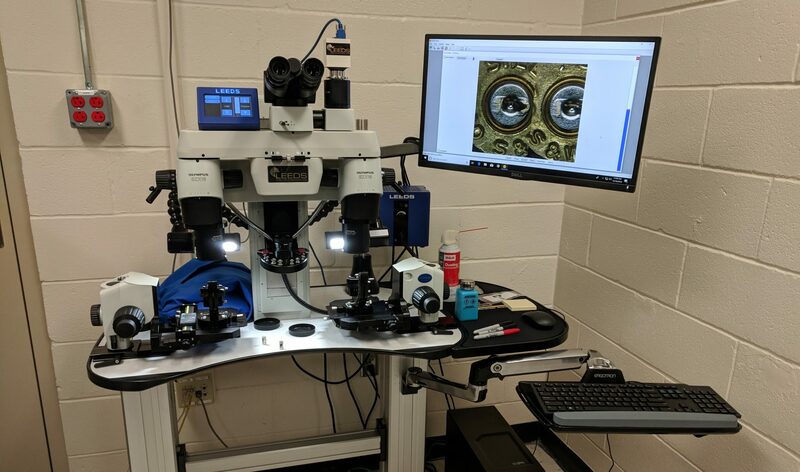 This high-powered microscope allows Berks County investigators to compare marks on shell casings to see if there may be a connection between gun crimes in the area. "Now, we can match those casings from one incident to the other, we can start putting those pieces together." (Leesport) — Law enforcement in one eastern Pennsylvania county has unveiled a new tool to crack down on gun violence. Police officers in Berks County used to have to send ballistic evidence to the state police lab and sometimes wait months to get the results. Now the county’s forensic lab has the equipment and membership to participate in the National Integrated Ballistic Information Network (NIBIN). It allows investigators with the county district attorney’s office to analyze evidence in-house and compare it to what’s in a national database. Captain Paul Reilly heads the investigations division of the Reading Police Department, and said the technology will help them connect the dots between crimes faster. Previously, Reading police could only submit ballistic evidence from a case where a person, home, or car was shot. “And now with this NIBIN machine we’re able to submit casings from every type of incident that we have where shots are fired, so we’re going to get more results and more correlations,” Reilly said. He added the change will hopefully lead to successful prosecutions and cut down on gun violence in the city. In the month since they started using the equipment, Reilly said they’ve found six matches in 20 incidents. Berks County D.A. John Adams said he hopes to eventually expand access to the technology to other counties so it can be more of a regional tool.